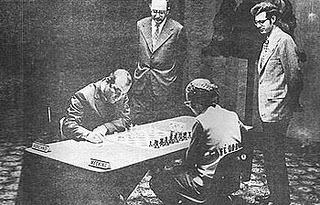 Korchnoi qualified for this match from the Leningrad Interzonal (1973), and Mecking qualified from the Petropolis Interzonal (1973). The three other quarterfinals were the Spassky - Byrne Candidates Quarterfinal (1974), Petrosian - Portisch Candidates Quarterfinal (1974) and Karpov - Polugaevsky Candidates Quarterfinal (1974). Victory would go to the player who first won three games, or to the player in the lead after 16 games. If 8-8, the winner would be picked by lottery. (1) The matches were held in order to select a challenger for Robert James Fischer, the World Champion. Korchnoi advanced to the Korchnoi - Petrosian Candidates Semifinal (1974). 2) Candidates' Matches 1974, by Mikhail Botvinnik, Aleksandar Matanovic, Bozidar Kazic and Mikhail M Yudovich Sr. (Belgrade 1974). 3) At which address Regency Inn had a major overhaul in 2013 and changed name to Holiday Inn Express (Augusta Chronicle, 30 July 2013). 4) Augusta Chronicle, 23 January 1977, p. 13. 5) Augusta Chronicle, 13 January 1974, p. 14. 6) Augusta Chronicle, 12 January 1974, p. 11. Botvinnik's book says 11 January. 7) Augusta Chronicle, 15 January 1974, p. 10. 8) Augusta Chronicle, 16 January 1974, p. 15. 9) Aiken Standard, 15 January 1974, p. 7. 10) The composer of the FIDE anthem, Wikipedia article: Gian Carlo Dal Verme. 11) Augusta Chronicle, 22 January 1974, p. 11. 12) Augusta Chronicle, 24 January 1974, p. 8. 13) Augusta Chronicle, 26 January 1974, p. 12. 14) Augusta Chronicle, 29 January 1974, p. 14. 15) Augusta Chronicle, 30 January 1974, p. 13. 16) Augusta Chronicle, 13 February 1974, p. 42. 17) Game 9 was played in the civic room of the Georgia Railroad Bank Building because of a scheduling conflict (Augusta Chronicle, 5 February 1974, p. 11). 18) Augusta Chronicle, 15 February 1974, p. 1. 19) Augusta Chronicle, 25 February 1974, p. 13. *FIDE Rating List July 1973. #Prizes in US dollars according to Botvinnik's book (note 2). Original collections: Game Collection: WCC Index (Korchnoi-Mecking 1974) by User: Hesam7 and Game Collection: Korchnoi - Mecking Candidates Quarterfinal 1974 by User: Tabanus. Game dates (Jan 16, 17, 19, 20, 23, 26, 27, 30, Feb 2, 6, 7, 9, 13) are from Augusta Chronicle. Thanks to User: OhioChessFan, User: Chessical and User: zanzibar for improving the English. offramp: Mecking turned up for game one wearing a t-shirt on which was written <Cafė do Brasil>. Kortschnoi said, "Perhaps I should wear a t-shirt saying <DRINK VODKA MOCBA>. offramp: I should have mentioned, this is another superb introduction. Thanks to the author! Very well done! Aug-20-16 siggemannen: There was a similar incident in Petropolis, where Mecking was wearing a shirt of a local soccer club or such. Bronstein therefor took his "Dinamo" shirt to the game, which ended in a draw between the "clubs"
Keyser Soze: I know he is a Flamengo supporter. Tried to find some pic but couldn't find anything in that period. Dec-19-17 Fanques Fair: This match is curious. Mecking had every chance of beating the great Victor Korchnoi. In fact, in at least 2 of his 3 losses, Mecking had a superior position during most of the games. It can be said that he lost to himself . "Kazic asked pro-tem Mayor K. Johnson to choose between two envelopes which contained a black and a white pawn and the name of the contenders. Johnson picked the one with Mecking's name on it. Mecking was thereby given the opportunity to choose from either hand of Korchnoi who held a pawn in each palm. He chose Korchnoi's right hand and the pawn was black, thereby giving Korchnoi white in the opening game."